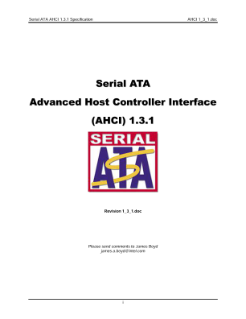 This specification defines the functional behavior and software interface of the Advanced Host Controller Interface (ACHI), which is a hardware mechanism that allows software to communicate with Serial ATA devices. AHCI is a PCI class device that acts as a data movement engine between system memory and Serial ATA devices. AHCI host devices ...(referred to as host bus adapters, or HBA) support from 1 to 32 ports. An HBA must support ATA and ATAPI devices, and must support both the PIO and DMA protocols. An HBA may optionally support a command list on each port for overhead reduction, and to support Serial ATA Native Command Queuing via the FPDMA Queued Command protocol for each device of up to 32 entries. An HBA may optionally support 64-bit addressing. AHCI describes a system memory structure which contains a generic area for control and status, and a table of entries describing a command list (an HBA which does not support a command list shall have a depth of one for this table). Each command list entry contains information necessary to program an SATA device, and a pointer to a descriptor table for transferring data between system memory and the device. Read the full Serial ATA AHCI Specification, Rev. 1.3.1.